The year 2014 will mark 50 years of diplomatic relations between Jamaica and Japan. One of the first events to mark this occasion is a Japanese Animation Film Festival and Manga Poster Contest. 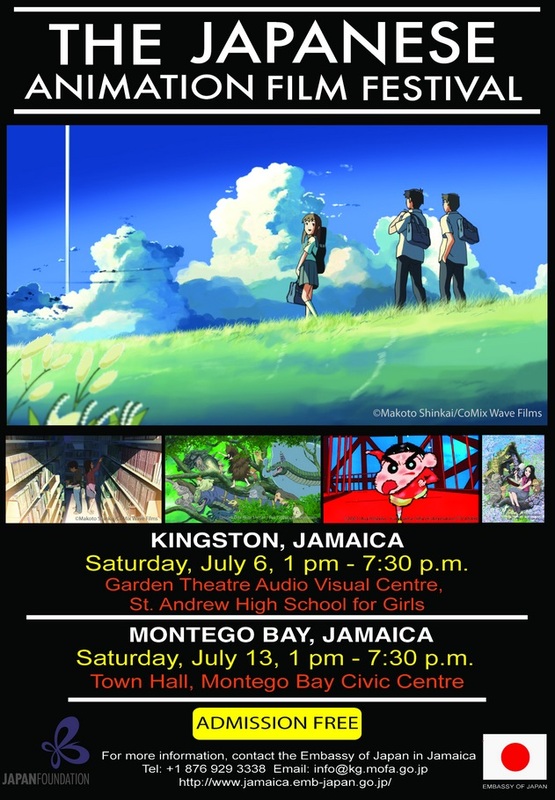 The poster contest is open to all high school students in Jamaica and the Japanese Animation Film Festival will take place on July 6th 2013 in Kingston at the Garden Theatre Audio Visual Centre, St. Andrew High School for Girls and on July 13th at the Town Hall, Montego Bay Civic Centre. The award ceremony for manga Poster Contest will take place during the film festival. Check the schedule for more information as well as the Manga contest rules. See you at the Kingston event on July 6th! If you’re going (and what’s the chance of you NOT? ), can I bum a ride? I don’t drive unfortunately, but I hope to be there! Hope to see you!